Data in every organization is growing in volume and complexity faster than ever. Yet, only a small fraction of this invaluable asset is available for analysis. Traditional data warehouses have rigid architectures that do not scale for modern big data analytics use cases. Hadoop systems work well for processing massive volumes of big data, but they're not a substitute for a data warehouse's performance and easy access to insights via SQL tools. Organizations that use Hadoop systems along with traditional data warehouses are unable to derive insights that require data from the data warehouse and Hadoop systems together. Amazon Redshift is a fast, fully managed, and cost-effective data warehouse that liberates your analytics pipeline from these limitations. 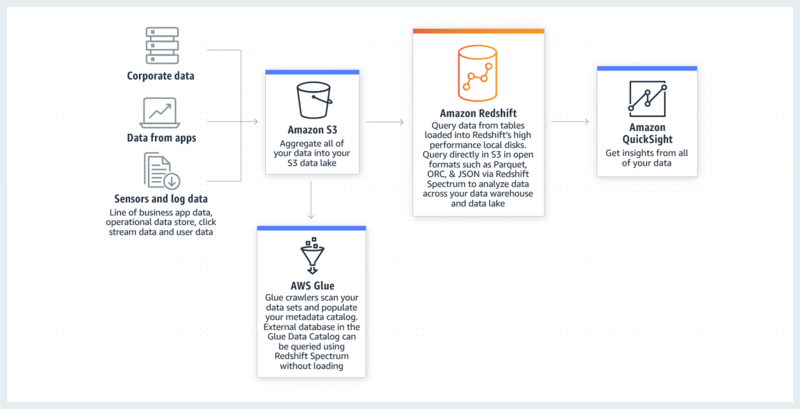 You can run queries across petabytes of data in your Amazon Redshift data warehouse and exabytes of data in your data lake in-place. You can setup a cloud data warehouse in minutes, start small for just $0.25 per hour, and scale to over a petabyte of compressed data for under $1,000/TB/Year - less than one-tenth the cost of other solutions. 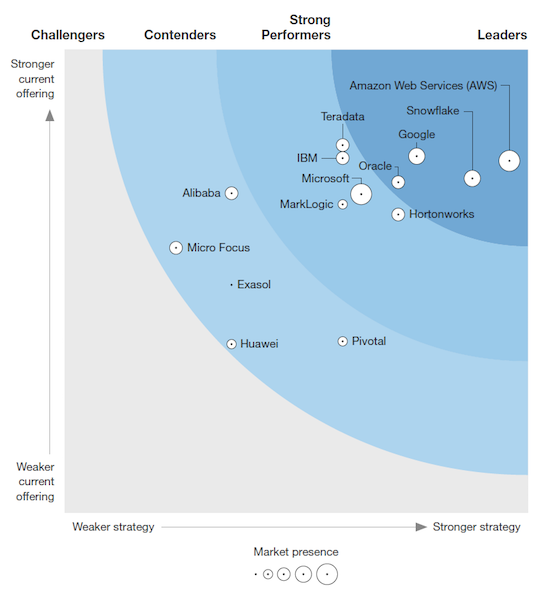 Amazon Redshift a cost effective cloud data warehouse and less than 1/10th the cost of traditional data warehouses. There are no upfront costs with Redshift and you only pay for what you use. Finally, Amazon Redshift eliminates cost of downtime and security issues. You can encrypt data at rest and in transit, isolate your clusters with Amazon VPC, and be compliant with GDPR, HIPAA, ISO, and other industry-specific security regulations. Amazon Redshift is fully managed and simple to use, enabling you to deploy a new data warehouse in minutes and load virtually any type of data from a range of cloud or on-premises data sources. It automates most of the common administrative tasks to manage, monitor, and scale your data warehouse. It delivers fast query performance, improves I/O efficiency, and scales up or down as your performance and capacity needs change. With your data warehouse on AWS, you can go beyond data loaded on to local disks and query vast amounts of unstructured data in your Amazon S3 data lake - without having to load or transform any data. You can query data in open formats, including CSV, TSV, Parquet, Sequence, and RCFile. Having your data available in open formats in your data lake ultimately gives you the flexibility to use the right engine for different analytical needs. Founded over 30 years ago, Sushiro is now the top Kaiten Sushi chain in Japan. 380 Sushiro stores stream live data from Sushi plates. Amazon Redshift enables Sushiro to convert this real-time data into insights for demand forecasting, minimizing food waste, and improving efficiencies. AWS Database Migration Service (DMS) is a self-service tool you can use to migrate your data from the most widely used commercial data warehouses to Amazon Redshift. The source database remains fully operational during the migration, minimizing downtime to applications that rely on the database. When migrating databases to Amazon Redshift, you can use DMS free for six months. AWS Competency Partners offer a wide range of migration services to help you move your data warehouse to Amazon Redshift. Through proven best practices and resources, partners can provide migration support that reduces the time and barriers of moving a data warehouse to the cloud. 47Lining, now part of Hitachi Vantara, is an AWS Premier Consulting Partner with Big Data and Machine Learning Competency designations. View their Data Warehouse Modernization Jumpstart Package. Cloudreach is a leading provider of software-enabled cloud services. They have empowered some of the largest and best known enterprises in the world to realize the benefits of cloud. Cloudwick is the leading provider of enterprise business and technology modernization services and solutions to the Global 1000. View their advanced analytics Jumpstart consulting offer to modernize your data warehouse. Tensor IoT's Amazon Redshift practice helps customers prove-out, pilot, and accelerate their cloud data warehouse initiatives with best-of-breed architecture, rapid data ingest, transformation, and modeling for analytics. Agilisium is a Los Angeles based Big Data and Analytics Company with clear focus on helping organizations accelerate their “Data-to-Insights-Leap”. Equinox Fitness migrated its Teradata on-premises data wrehouse to Amazon Redshift. 21st Century Fox migrated its IBM Netezza on-premises data warehouse to Amazon Redshift. Edumonds.com migrated its IBM Netezza on-premises data warehouse to Amazon Redshift.